Debra Messing is Joined by Son Roman at Angel Awards 2018! Debra Messing poses on the blue carpet with 14-year-old son Roman as they arrive at the 2018 Angel Awards on Saturday night (August 18) in Los Angeles. The 50-year-old Will & Grace star looked super glam in a purple dress as she attended the event where she was honored with the Founder’s Award. Other stars at the event included Charlie Sheen, Cheyenne Jackson and husband Jason Landau, Holly Robinson Peete and daughter Ryan, Tyler Henry, Charo, and Juan Pablo Di Pace with wife Maria. FYI: Debra is wearing a Jovani gown and Vendorafa jewelry. Cindy Crawford and Kaia Gerber take a break from hosting duties for a photo while attending a Mother’s Day Luncheon on Saturday (May 13) in Malibu, Calif. The mother-daughter duo hosted the lunch in partnership with the Best Buddies Organization and David Yurman to celebrate the incredible mothers of Best Buddies participants and mothers all around the world, and paying homage to the gifts of love and friendship that mothers give to their children, especially the mothers of best buddies. Also in attendance were Vanessa, Stella, and Gina Hudgens, Nolan Gould, Dylan Brosnan with his parents, dad Pierce and step-mom Keely, and brother Paris, Milla Jovovich and her daughter Ever, Molly Sims with her daughter, Holly Robinson Peete, Vivica A. Fox, Maria Shriver and her daughter Christina, Lisa Rinna with her family, Frances Fisher, Nancy O’Dell, Jackie Cruz, Amanda Cerny, and Jane Seymour, among others. “What a great way to Celebrate Mother’s Day – supporting @BestBuddies with my mom!” Cindy wrote on Instagram with a pic of her and her mom after the event. 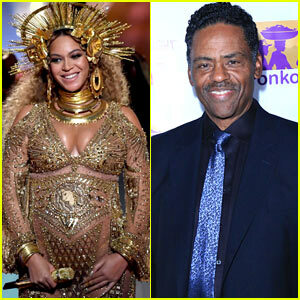 Beyonce Helps Celebrate Stepfather Richard Lawson's 70th Birthday! Beyonce stepped out to celebrate her stepfather’s birthday! The 35-year-old pregnant entertainer attended the surprise birthday dinner hosted by her mom Tina Knowles Lawson as they celebrated Richard Lawson‘s 70th birthday at The District by Hannah An Vietnamese restaurant on Tuesday night (March 7) in Los Angeles. Other guests at the party were close family friends Kelly Rowland and husband Tim Witherpoon, Holly Robinson Peete and husband Rodney Peete, along with other friends and family members. That same night, Beyonce‘s husband Jay Z was spotted talking on the phone while out to dinner in New York City. Also pictured inside: Jay Z and producer Harvey Weinstein speaking on stage during a Town Hall Discussion on Spike TV on Wednesday (March 8) in NYC.